Glen Campbell, I’ll Be Me, directed by James Keach. Photo Courtesy of PCH Films In my daily battle against Alzheimer’s, often a painful, battering, in-your-face assault, I look to role models. Chief among them is Glen Travis Campbell. If anyone has true grit in the fight against this demon of a disease, it’s Campbell. Diagnosed with Alzheimer’s in 2011, Campbell refused to retreat, courageously relying on his muscle memory as one of the nation’s finest songwriters and country/pop singers, and teaching the rest of us how to shine when the stage lights begin to dim. On good days, bad days, and days when the enemy is at the gate, the country boy in Campbell, the purity of his heart, speaks with clarity to the world. In Campbell’s gentle soul, he is not “shackled by forgotten words and bonds.” While the words at times have left him, the bonds are never-ending with his faithful family, friends, and anyone who cares to embrace the enduring vision of a man comfortable enough in his own skin to have taken an immeasurable risk on a national stage as a daring role model of living with Alzheimer’s, not dying with it. Upon announcing his diagnosis, parallel to a death sentence, Campbell, along with his courageous wife, Kim (Woolen), and three of his gifted children, daughter Ashley and sons Cal and Shannon, launched an intrepid “Goodbye Tour” — 151 inspiring concerts throughout the nation. The Goodbye Tour, subject of a newly released film by award-winning filmmakers James Keach and Trevor Albert, was a labor of love for Campbell, a labor that would have tested a man half his age, unfettered by disease. I’ve been blessed to know the Campbell family, along with filmmakers Keach and Albert. They are soldiers on the front lines in this lonely fight. Glen Campbell was a lamppost earlier in my life. I was drawn to his music as a young man on cross-country trips from Westchester County in New York, to the University of Arizona in Tucson, where I studied journalism; Campbell’s sweet, often raw and throaty voice, resonating from a vintage eight-track tape cartridge, offered the verve to keep me focused while driving my yellow Opel Kadett. The two of us were worlds apart, yet unknowingly headed on a collision course with Alzheimer’s. Campbell, in his fight, still keeps me focused and driving — with or without my keys. On the road, I memorized just about every lyric of his Greatest Hits album, produced in 1971, never forgetting to hit the replay: “Wichita Lineman” as I crossed Kansas; “By the Time I Get To Phoenix,” as I drove through the Petrified Forest in remote northeastern Arizona, often at 2 a.m. with moonlight glistening off the semi-desert shrub steppes and colorful badlands; and “Gentle On My Mind” as I passed the graceful Santa Catalina Mountains, rising from the valley on the outskirts of Tucson. I can still hear Campbell’s voice. 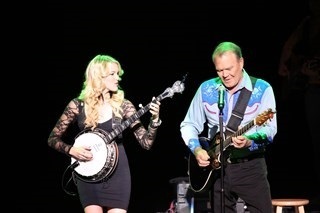 In Glen Campbell… I’ll Be Me, filmmakers Keach and Albert have eloquently captured the marvel of Campbell’s music, his love of family, and his battle against Alzheimer’s. For anyone seeking to understand the journey of this disease and the endless solitary struggle “to be me,” this film is required viewing; it is edifying to the point of boundless wisdom. I’ll Be Me grabs you from the start with Campbell, in declining articulation, and wife Kim, sitting on a couch, looking at sepia photos and watching videos of the country star in his younger years. “Who is that?” Campbell innocently asks. “That’s you honey,” Kim replies. The genius of the Keach/Albert film is in its portrayal of a man willing to “be me” with the gut instincts and heart of a prizefighter battling to the final bell. If only all of us had the faith “to be me.” This film is not a misery memoir. It’s a bold, shake your fist at Alzheimer’s from Campbell and his family. Weaving throughout the film are poignant scenes in the Campbell home, in rehearsals, and with Campbell’s distinguished friends and doctors like Dr. Ron Peterson, director of the Alzheimer’s Research Center at the Mayo Clinic, who was Ronald Reagan’s personal physician. “I’ll Be Me” also features cameo interviews with notables who, in one way or another, have been touched by Alzheimer’s, including, Bill Clinton, Bruce Springsteen, Chad Smith of the Red Hot Chilly Peppers, and country singer/songwriter Brad Paisley, who lost his grandmother and his mother to Alzheimer’s. The “off” switch in Alzheimer’s is most troubling. Campbell’s message, on the lip of National Alzheimer’s Disease Awareness Month in November, goes far beyond the evocative virtuoso of his music. “Alzheimer’s,” Campbell states candidly, “is one of the worst things… It would be an incredible blessing to get people to understand that.” Sadly, Campbell now is in a care facility, and can only sing from his heart; others now are singing for him. It is a godsend that Campbell and his family have let us into their lives for heart-rending edification on a disease that few understand, and yet one that will paralyze this nation, medically and financially in short years to come. Today, there are an estimated 35 million people worldwide diagnosed with Alzheimer’s or a related dementia; an estimated five million in the U.S. afflicted with Alzheimer’s; and predictions of up to 13.8 million Americans diagnosed with the disease by 2050. Alzheimer’s is the fifth leading cause of death in the U.S., and the only disease in the nation’s top 10 that cannot be prevented, cured or slowed. It is said that in the next 25 years, there will be two types of people: those with Alzheimer’s, and those caring for someone with the disease. Viewing this film earlier in summer at the impressive American Film Institute Festival at the Smithsonian in Washington, D.C, I was overwhelmed; emotions crept up on me. I wept for Glen Campbell and his family; I wept for my mother and my maternal grandfather, both of whom died of Alzheimer’s. It is now coming for me. If the song doesn’t move you to tears, please check your pulse. My reflections are not meant to be a traditional review of an extraordinary film; they are a call to arms to see this film. My prayer is that you will be moved to action by it — for yourself, for your children, and for your grandchildren. Alzheimer’s, or related dementia, could be your story someday, or the story of a loved one. Those are lyrics Campbell would be blessed to hear. Greg O’Brien’s latest book, On Pluto: Inside the Mind of Alzheimer’s, is available on Amazon.com and OnPluto.org. He is also the subject of the short film, directed by award-winning filmmaker Steve James, online at livingwithalz.org. In 2009, he was diagnosed with Early Onset Alzheimer’s. His maternal grandfather and his mother died of the disease. O’Brien also carries a marker gene for Alzheimer’s.